After 14 years as a truck driver, Jim Hammond is hanging up his keys. Having a business that allowed him to travel was important to Jim. Due to his previous careers in the navy and IBM, Jim has friends all over the United States and wanted a career that allowed him to visit them with ease. “I was used to seeing the world from 30,000 ft.,” Jim said, referring to his time spent traveling for IBM. “Now I wanted to see it from 8 ft.” Trucking gave Jim the opportunity to see friends and family, and play golf all over America. Jim keeps a notebook where he writes down every detail about every trip, expense, and conversation. “Why try to remember it when you can write it down?” he says. As an independent contractor, his notebook has also helped him with taxes. “This,” he said, tapping his notebook, “is gold to the IRS.” His system helps him organize his receipts and paperwork, helping him remember what goes where when tax season comes. Having good communication with your Driver Manager is crucial to running a good business. “Don’t be afraid to talk through problems” you face while over-the-road. Your Driver Manager is there to help you succeed. If you do not tell your Driver Manager of an issue, then the issue will never be fixed. Even though Jim is leaving his truck, he is not leaving the industry. He will still be around to offer advice and suggestions to other drivers, but now as a Recruiter. 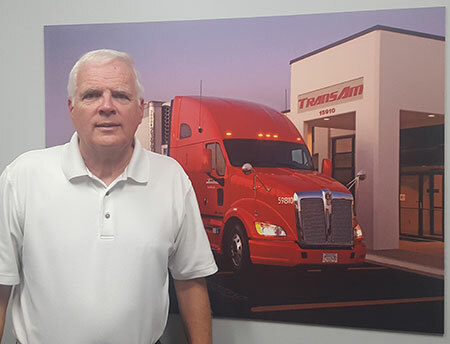 We are thankful to Jim for the time he contracted with TransAm Trucking and we are grateful he decided to continue his passion for the trucking industry with TransAm Trucking. Thank you, Jim.